Promotional thermos flasks or vacuum flasks as they are also known are a great marketing idea for people on the move and will help to keep protect their drinks whether hot or cold. 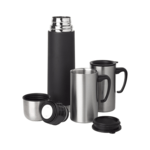 We supply thermos flasks in all sorts of shapes and sizes as part of our drinkware range which also includes travel mugs. Please check out the vacuum flasks below and if you need a sample or advice on your artwork please contact our team. Want to help your customers or employees keep warm this season? Take a look at our range of branded hip and thermos flasks. Printed flasks make an excellent choice of promotional gift, especially during the winter months. You can help your customers or employees keep hot drinks warm while they travel to work. They are bound to be grateful their morning coffees are still warm after the commute to work. Printed flasks can also be used outside the office as well. Perhaps your customers or employees want to enjoy a hot drink while they watch the kids play football at the weekend, or while they take their dog to the park. There really are so many uses for branded flasks, which means your company could gain maximum brand exposure from an investment in printed flasks. All of our flasks can be printed with your logo or marketing message. Printing can be done in up to four spot colours. All of our printed flasks offer generous print margins, so you can proudly boast your branding. If you need any help choosing the right personalised flask for you, or you would like help with your artwork, then contact our friendly promotional consultants. We will be more than happy to help. Call us on 0800 158 3080 or email us. We will be dedicated to creating the perfect branded flasks for your company. At Redbows, we provide a wide selection of printed flasks, so we have something to suit all tastes. With a variety of different styles, colours and sizes to choose from, you can personalise every last detail of your printed flasks. Whether you’re looking for a promotional flask with a useful handle and strap, or you prefer a hip flask with two cups, we are confident we can provide the perfect personalised flasks for you. 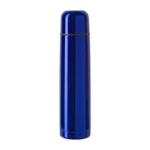 When considering flasks for a promotion there are two types: hip flasks and thermos flasks. Hip flasks are designed to carry around an alcoholic beverage like a whisky, brandy or even a sloe gin and have traditionally been associated with sporting and outdoor events where one may need a quick shot of something to warm up and where this type of activity is not dangerous to other people or animals. We have a range of hip flasks supplied either by themselves or in a carry case that can be branded with your logo. Please see the individual models for prices, specifications, lead times and options. 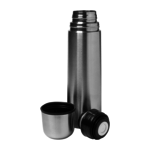 Thermos flasks are designed to carry around a cold or hot liquid and a hot one is the norm. This may be a soup, tea or coffee or some other beverage that the user wants to keep warm for a period of time whilst travelling. 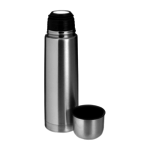 Our most popular thermos flasks are cylindrical and can range in size up to 1000ml (1Litre) with smaller versions available around 500ml. 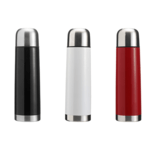 Thermos flasks come in all sorts of colours and can be made from different materials. They can be branded with your logo either on the barrel of the flask or the lid which may provide an additional branding area as may the cup supplied with the flask. 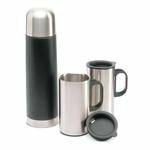 Thermos flasks can be made from stainless steel or plastic. 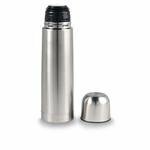 Stainless steel flasks be either stainless silver in colour or have a coloured paint applied to provide a good background for your imprint. This type of flask can also have an outer plastic shell onto which a screen print wrap can be applied. Thermos flasks keep their contents warm because they use an inner container inside a vacuum (hence the other term vacuum flasks). Heat is a form of energy that can travel from one object to another via convention or radiation. The use of the internal container and vacuum prevents the heat transferring via convection to the outer shell and so prevents major heat loss from the liquid inside. Whatever the energy inside the hot liquid when it was put into the flask, it is retained to keep it warm and is only ever released when the top is open. So if you have a hot tea or coffee in your flasks, remember to put the lit back on quickly straight after pouring if you want the contents to remain warm. Promotional travel mugs also keep liquids warm and are a great way to take a tea or coffee with you on the go but they generally do not incorporate a container in a vacuum and whilst they may be double insulated, won’t keep contents as warm and hot as a proper thermos flask. How do vacuum flasks work? Thermos and vacuum are interchangeable terms of flasks like these that keep their contents warm. Vacuum flasks have a two wall construction. The inner glass wall has a lining with a metallic silver coating that prevents the internal heat from the liquid being transferred to the outer layer via radiation. The inner and outer walls are separated by a vacuum which prevents heat convection from the inner to the outer layer. The glass wall is thin and prevents heat transfer via conduction. Can I purchase extra cups for my flasks? We can supply extra cups to go with your flasks and these can also be branded. 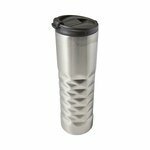 The most popular type for camping and outdoor pursits are our metal cups and mugs. What print options are available for these flasks? The most common imprint methods are screen or pad printed or engraved. A screen or pad printed logo will be hard wearing with an engraved imprint being permanent. The type of imprint method depends on the material. Stainless steel and metal bodies are suitable for engraving or a screen or pad print. Plastic flask bodies can only take a pad or screen print.